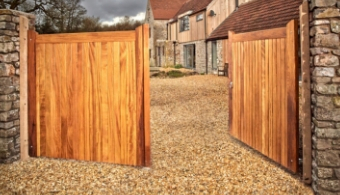 Our driveway gate range from Charltons, have been carefully designed to give the highest quality with designs that are distinguished and impressive. 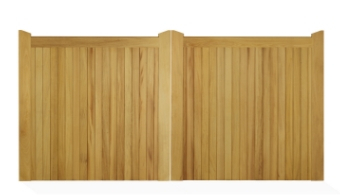 These not only enhance the entrance to a property but also offer privacy & security. 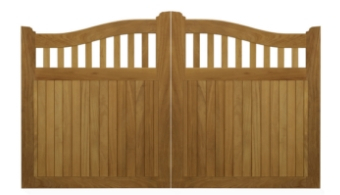 All our driveway gates are bespoke and made to order, with a range of options on stile top and automation. Please note that all gates which are to be automated must have a heavy duty bottom rail. Fill out our Easy Quote form here to get the process started and either send into your local branch or straight to Charltons. All our driveway gates have been further improved with water run off features helping to extend the life expectancy of the gate. 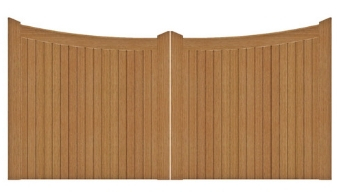 Impressive and imposing with tongue & groove match boarding - ideal for security and privacy. 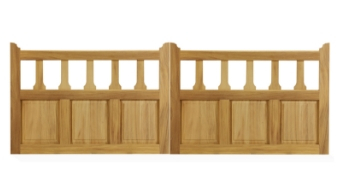 Constructed using strong mortice & tenon joints with superior section sizes. 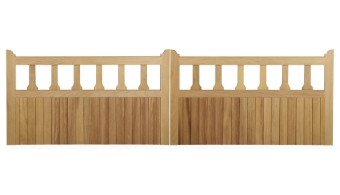 This gate has water runoff features and a planed smooth finish. 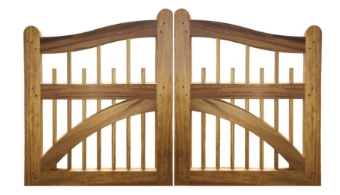 A solid, good quality gate with a domed head and tongue & groove match boarding; built to last with full mortice & tenon joints.Planed finish. One of Charltons most popular gates. 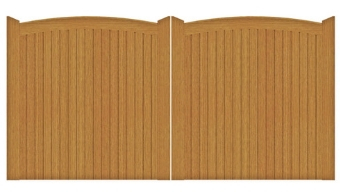 Tongue & groove match boarding with vertical pales to see through whilst still offering security. Strong mortice & tenon construction with superior section size. Water runoff features, planed finish and choice of stile tops. Also available with a flat top. 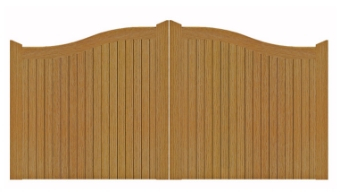 A classic, mainly tongue & groove boarded gate, with vertical pales adding height. Features chamfering along both the top and mid rails allowing the rain to run off. 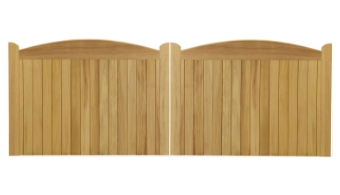 A good value gate makes for a less expensive option for a driveway as it is available in standard sizes. It is also available in smaller sizes. Planed finish. 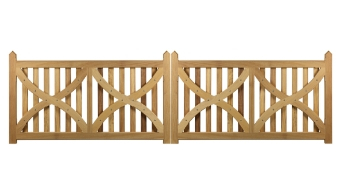 A prestigious gate in a traditional Victorian design. 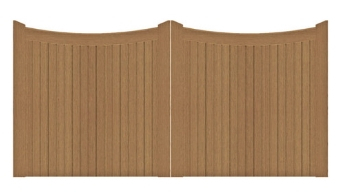 With its straight top, shaped pales and grand panelling, this timeless classic will continue to retain its style whilst offering security for small children and pets. Strong mortice & tenon joints, water runoff features and a planed finish . 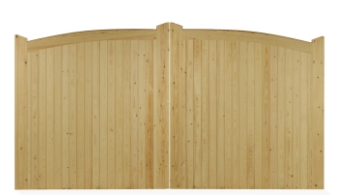 A traditional driveway entrance gate with concave single bowed top rail on each leaf with styled pales whilst offering security for small children and pets. Tongue & groove match boarding. Mortice & tenon construction. Water runoff features and a planed smooth finish. Similar to the Mells with its part boarded lower section, but with a straight top rail. Greatly enhancing any driveway as well as creating a grand opening to any garden whilst offering security for small children and pets. Tongue & groove match boarding and strong mortice & tenon construction. Water runoff features and planed finish. 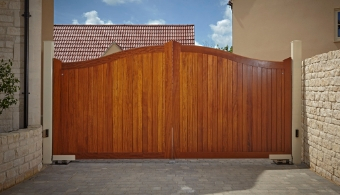 An unusual yet attractive driveway gate with detailed chamfering to stiles and top bar. Strong mortice & tenon construction with superior section size. Water runoff features. Planed finish. 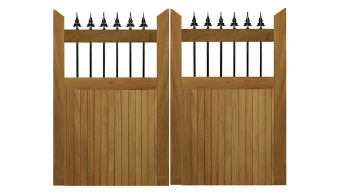 A stylish gate which incorporates black finished steel finials which run through the top bar for added strength with tongue & groove match boarding. Mortice & tenon joints with Water runoff features and planed finish. 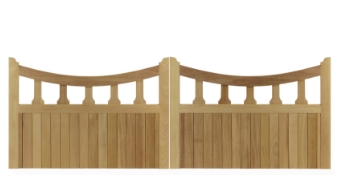 A new addition to the range, this attractive gate has a superior 66mm section size. Strong mortice & tenon construction. Heavy duty bottom rail as standard. Water runoff features, planed finish.